Ivel Valley School in Biggleswade achieves Centre of Excellence status. Ivel Valley Special School caters for pupils with a variety of special needs including autism, cerebral palsy, and Down’s syndrome. Most pupils have severe learning difficulties or profound learning difficulties. Some pupils also have additional SEMH needs. There are 187 pupils on roll ranging from KS1-KS5. Ivel Valley is spread over two sites with additional satellite classes based in two mainstream schools. One school caters for KS1, KS2 and KS3 whilst the other caters for KS4. This arrangement works exceptionally well as the pupils can access mainstream provision if it is deemed appropriate and expertise can be shared between schools. They also wear the uniform of the mainstream school which makes them fully inclusive of their environment. The school also host on site three outreach teams including the Early Years, Autism and SEND and Disabilities for the LA. These teams work with the wider community but also work closely with the school. These arrangements ensure inclusion is at the forefront of the school’s practice. Ivel Valley School has created an environment and a curriculum to cater for the diverse needs of the pupils. This enables the pupils to take ownership of their learning and to develop growth mindsets of self-realisation and self-regulation to become successful and responsible citizens. This was clear to see during the IQM assessment. The day included a tour of the school and a learning walk. Discussions took place with key members of staff including the Principal, members of the SLT, including the Inclusion Lead, various members of staff, parents and pupils. Conversations with all the staff showed they had a true sense of purpose and dedication. They wanted the very best for all the pupils and to create opportunities to improve the lives of all pupils. The staff were confident in their knowledge of the pupils which meant the pupils were on task and motivated to learn in the classroom. Planning ensured differentiation had an impact on the progress of the pupils with Learning Objectives and Success Criteria. Classroom displays and displays in the corridors were related to the pupils’ learning. Feedback was clear with learning put into context. Ofsted rated the school as good in May 2018 and stated, ‘Adults know pupils well and work together seamlessly to meet pupils’ learning and developmental needs as lessons go on…… Teachers discuss the progress of individual pupils with you, to decide whether interventions may be needed to make sure that they continue forward.’ This was apparent throughout the learning walk over the two sites and the satellite classrooms. The planning also showed how improvements were being made in writing for example, the SDP showed needs were being addressed through analysing data and ensuring good practice was shared amongst staff with more training in Colourful Semantics, InPrint3 and Clicker 7. The school’s aim is to prepare all pupils to be able to ‘integrate into society’ and to become ‘as independent as possible’ whatever their individual needs. This was apparent throughout the visit. To this end, the Principal and the SLT have re-evaluated the structure over the two sites and are altering the organisation so that the older pupils in KS5 have one site nearer to the town which will specialise in rigorously preparing them for ‘life after school’. The school prepares the pupils for transition well and identifies key members of staff who will work well with individual pupils. They also ensure that all pupils have transition booklets to make them feel secure, to show them their new environment including visual images and symbols of key members of staff and key areas in the school. In addition to this, there are transition booklets for the pupils to write about themselves. The pupils interviewed all loved the school and the opportunities available to them. They clearly valued the staff and felt that they were developing in confidence. They used words such as ’awesome’ to describe the staff. They said they are given a choice in what they did and were offered social skills and life skills to help them become confident and more positive. They stated that they can play in sports tournaments and have trips out. They had raised money for Comic Relief and were taking part in ‘Purple day’ for epilepsy awareness with a cake sale. Some older pupils had just completed the Bronze Duke of Edinburgh Award which was an outstanding achievement. They also stated that they have access to qualifications such as entry levels, functional skills, vocational qualifications and the qualifications are individualised to meet their interests such as horticulture, hair and beauty and cookery. Ivel Valley makes outstanding use of the space available. All areas are wheelchair accessible. The outside area is very well thought out with excellent outdoor facilities including a horticulture area, space for a sensory garden for those who wish for reflection time and an enclosed court area. The Principal is developing and creating an environment with a sense of purpose for every classroom. All classrooms have symbols in ring bound booklets for general use as well as pupils having PECs books, symbols, picture word schedules, BIGmacks, Go Talks and sign language according to their individual needs. Classes are well resourced with iPads with focused programmes such as Proloquo2Go and whiteboards or touch screens to encourage interaction. Each site has a multi-sensory interactive learning environment room (MILE). These are used for MOVE Programmes and sensory lessons. During the Learning Walk, we witnessed the pupils fully engaged in one of the MILE rooms. Sensory Circuits are used to improve gross motor skills amongst the pupils. During the learning walk it was evident that the curriculum was geared towards enabling the pupils to become independent; teaching them skills for life across a broad range of subjects and opportunities. Currently, there is an organisational approach to teaching groups in stage not age. This is for pupils to feel safe in an atmosphere balanced to suit each pupil’s needs. The Principal is evaluating the organisation by assessing the data and skills set of the staff with a view for pupils to be taught in year groups but keeping the curriculum based on individual needs. Off-site provision is also available if the needs of the pupils cannot be met fully on-site. There is an opportunity for work experience in the local hospice shop, Henlow Grange and Leisure Centre for example, horse riding as well as visiting farms and local shops in the town. The pupils also experience the wider and global community. The Principal and members of the SLT and other staff were embarking on an activity trip to Norfolk including sailing as well as taking the pupils on another trip in the term to France. It was magnificent to witness the opportunities and to hear of the further developments in place to enrich the lives of all the pupils within the school community. The staff interviewed stated that they collaborate as a team respecting each other’s skills set and ensuring that their approach gives each pupil confidence to take advantage and to progress in all areas of school life. They felt that they were given appropriate training and support so that they felt confident in dealing with the challenging and complex needs of the pupils in their daily care. Parents/ carers confirmed that they felt supported with their child’s education and that ‘nothing was ‘too much trouble for the staff’. They said there was always an ‘open-door’ to discuss any issues. They said their children want to come to school and that the support for individual needs was ongoing and constantly evaluated and reassessed. They were always kept informed of their child’s progress. During the morning of the IQM visit, the pupils were busy preparing for a ‘Mad Hatters’ Tea Party’ day with all classes taking turns to work with the artist in residence who was in school for three days to prepare for the parade. The day had been sponsored by the Rotarians. Pupils were fully engaged with the activity. One class had constructed their classroom outside due to the activity taking place in their classroom. The teacher had put up a large tent with smaller tents around with bunting hanging from the trees. The pupils were clearly having fun and enjoying the innovative and creative outdoor learning. The teacher was incorporating Maths and English as well as social skills into the experience. The curriculum is based around themes as well as highly individualised timetables. For example, in KS1 Holidays, Lower KS2 Our Wider World, Upper KS2 Sports, KS3 Future and Past, Having Your Say. Timetables ensure the pupils experience targeted work to address their needs as well as themed work. Displays around the school reflected the pupils’ work. There was an outstanding display in the hall called ‘Flowers of the Valley’ that all classes had worked together and devised. Further development of the curriculum is to embed opportunities to communicate and collaborate to further enhance independent life skills and to develop higher aspirations for the more able pupils. 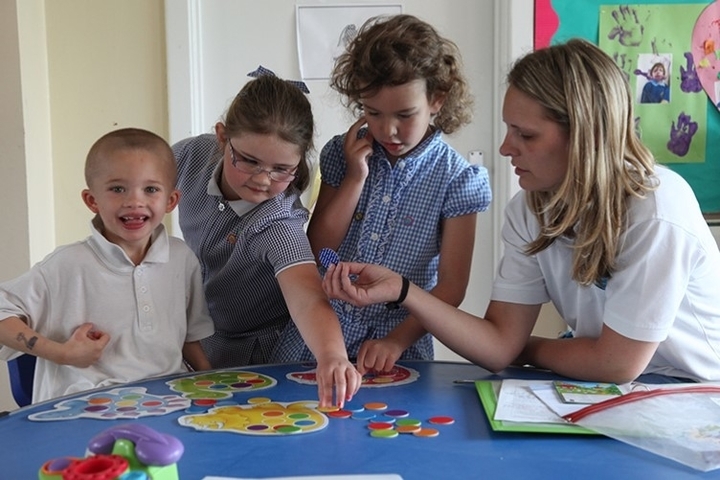 The school work closely with the community and external professionals including OTs, SALT, and Social Care. This ensures that the pupils are kept safe and feel supported with individual needs being met. There is a dedicated on-site medical team to support the medical needs of the pupils. The school has close links with the Rotarians who donate funds for the school. Links with the Sandy Lions Club allow pupils to take part in trips such as a visit to Wickstead Park with members of the school staff who give up their time freely to accompany them.